Jon Udell, the host of IT Conversations, interviews me on this week's show. I've long admired Jon Udell's columns in InfoWorld magazine, and it was really exciting to me to have an interviewer contribute so many insights, so that it really was a conversation, not a Q&A. The interview goes over a large number of topics, from my company Lyris to Magnatune to WreckAMovie and BookMooch. Coolfer has an interesting blog entry about applying the lessons from a Wall Street Journal article, which showed that people are willing to pay more for ethical products. Meanwhile, as the numbers show, the unethical group was demanding to pay significantly less for the product than the control group. In fact, the unethical group punished the coffee company's bad behavior more than the ethical group rewarded its good behavior. The unethical group's mean price was $2.42 below the control group's, while the ethical group's mean price was $1.40 above. So, negative information had almost twice the impact of positive information on the participants' willingness to pay. In the music industry, the "negative information" is all the RIAA lawsuits, DRM, and all-around bad publicity. The blue line is the weekly number, while the black line is a moving 3 month average. The trend is certainly clear: CDs, especially in the past year, are declining quickly. I'm not sure how to reconcile our sales numbers with the results of our recent survey, which showed 45% of respondents to might be interested (18% being "sounds pretty good" or "very interested") in a "CD Club"
Also note that in this survey, only 39% were possibly interested in the streaming membership (as it was explained in survey), while 71.4% were interested in the download membership, which is one reason I'm optimistic about the future. FYI, the survey had 600 respondents, which is a good enough size to be considered valid. A few days ago, the Magnatune home page changed and began offering all you can eat memberships for a monthly fee. I didn't announce it on this blog right away, because I wanted to make sure there were no problems with it and also to see what everyday visitors would make of it (and how it might affect our sales). I've written two quite extensive FAQs for the two kinds of membership plans, which should hopefully answer most questions. I will of course update it as new things pop up. In this blog entry I'd like to give you some of my preliminary analysis of how the membership offerings are going. Currently, almost everyone who is signing up for memberships is going for the pay-three-months-at-a-time download membership. We are selling enough of those every day to represent 150% increase on daily revenue (that's without announcing it, just converting everyday visitors). That's really tremendous, and I hope that keeps up. The numbers should get even better in the future, because right now we have just started the service and thus there are no renewals coming in. In three months, each day we should have new members signing up, but in addition to that some percentage of people who signed up three months ago will be renewing. Our task will be to make sure that the Magnatune membership is compelling enough that people want to renew after their three months have expired. In the first 12 hours after we announced the membership feature in our newsletter, 15 people signed up for download memberships (that's when I'm writing this blog entry) and one streaming-membership for 3 months ($27). One of those bought a lifetime membership ($294), all the others are three months at a time ($54/every-three-months). The minimum fee for the download membership is $54 (this gives you a 3 month membership), and this represents approximately 7 albums at about $8. That means that even with the 40% who were already frequent buyers, Magnatune does okay. Granted, the average for that heavy buyer group is 10 albums, or about $70, so if most of them cancel within three months, then we are down $16, but I doubt that most of them will actually cancel. They are probably joining because they like downloading lots of things from us, that's why they've previously purchased so much. Our "conversion rate"--the number of people who buy divided by the number of people who visit--has been declining steadily while our audience size has been increasing. At this point only one person in 300 who visits Magnatune and listens to music actually buys. When I started Magnatune the ratio was 1 in 32. This means that we need to do a much better job of converting people who enjoy listening to our music into people who support us financially. One reason I think people have been decreasingly likely to buy over the past five years, is that more and more people listen with their computer and not with a dedicated hi-fi and CD player, something that was not the case when we launched. What this means is that instead of evaluating our music on their computer in order to buy it and play it on their hi-fi, people simply listen to the free versions forever. I'm fine with a certain amount of that, but bandwidth is expensive, and I created Magnatune to build a business model to help musicians survive, so at some point some percentage of people need to buy in order to keep us alive. I think the reason that people are not buying the streaming membership at this point is because people are used to visiting the Magnatune website and simply ignoring the "commercials" at the end, which are hardly obnoxious. I will be making one change soon to the free site: song number three of each album will soon have 30 second "commercial" about our membership offerings at its end. My goal is to enable people to listen for free so they can decide to purchase an album at a time if they so choose, but to make it slightly less tempting for people to visit and never buy an album. Another reason I think people are not buying the streaming membership is because it feels odd to pay to listen to music that is on a website. You already can listen on our website, so why pay for something that isn't all that different? At the same time, people have told me they don't want to download music most of the time, they just want it available to them. 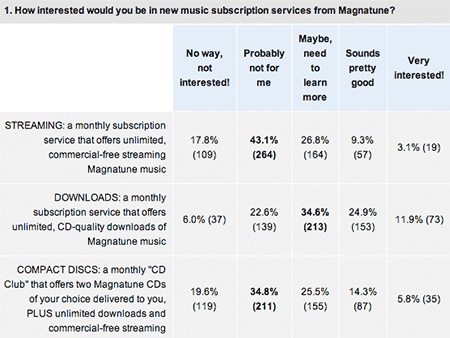 What I hope to do to solve this is to make the entire streaming music catalog from Magnatune be imported directly into your favorite music player. 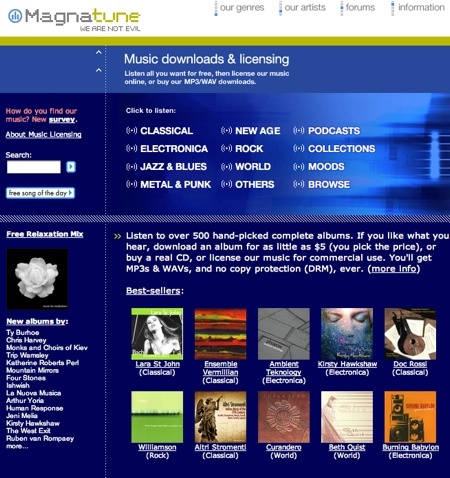 This way, you can listen to the local MP3 files that you already own, and the albums and songs from Magnatune streams, as if it were all the same thing and on your hard drive. It's the idea of a "music cloud" -- it's available to you, you don't really sweat the details of exactly where or how. For example, iTunes treats streaming MP3 files and local MP3 files identically in the catalog. This means that Magnatune could import all its albums into your iTunes library, so you can click to listen to your music inside iTunes, organize it as you wish, it's just that the MP3s are not on your hard drive, they are streamed when you listen. I'm pretty sure this is possible with Winamp, but less sure about Windows media player. Myself, I'm not that into having to carry a hard disk of MP3s everywhere, but at the same time I don't tend to visit web sites listen to music. I would really like to be able to just use iTunes to listen to the mix of albums I have that are local MP3s, along with music that happens to be on a remote Internet server, not having to figure out what is where, it just works. Another idea I have is to have a "personal podcast feed" for each download subscriber, so that instead of having to manually download each album you like, you can simply click a "add this to my podcast feed" button, and the album automatically downloads in the background into your iTunes, Winamp or Windows media player. Because the album is considered a podcast by your desktop software, your iPod or other MP3 player can automatically add the downloaded album to itself. In this way, the download membership would allow music to flow directly from the Magnatune web site into your iTunes and iPod just as easily as the iTunes music store (actually a little bit easier since you didn't have to choose to pay for it). Also, it means that if you choose to download several albums, you don't have to wait while it happens, it just occurs magically in the background. After the first 24h since announcing membership, I found that we sold 30% less albums than we typically do after an email newsletter, however the membership signups were so strong that we brought in twice the revenue that we normally do. I don't think the membership offerings are what has reduced album sales. Instead, I think it's because of the changes I made to the home page, that don't make listening to music as obvious as it used to be. 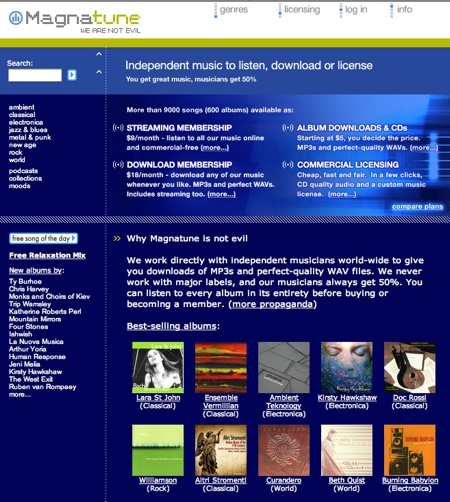 on the old home page, the central part of the page was dedicated to listing music genres, which I think was a much more compelling immediate action for new visitors to take, rather than reading about what we're selling you, which is what the new page does. which shows daily album sales before and after the new home page. In a few days, once the effects of the email newsletter have worn off on daily sales, I'm going to try a new home page, that uses the music-genres-in-the-center approach, and mentions that what-we-sell in a much less prominent way. Probably, the what-we-sell will go in the left hand column, where the genres are now in the current design. I'll let you know how it goes! So far, I'm really enthused by how well the memberships have been going. Before we announced them, they had led to a 150% increase in revenue. And after yesterday's announcement, we saw a 200% increase in typical-revenue--the-day-after-an-announcement. If we can keep people interested and renewing their membership, Magnatune will be in a very good place, and we'll be growing significantly again.